LOS ANGELES (November 13, 2018) - Grand Park announced an unprecedented experience -- Grand Park’s Winter Glow -- that showcases the West Coast’s unique holiday spirit and winter season. The new month-long, immersive nighttime light attraction will feature installations by local artists and celebrate light as a giver of warmth, a source of beauty, a draw for people to come together during the winter months, and a key element of many holiday season traditions across cultures. The event plays off of the Los Angeles tradition of visiting neighborhoods to see holiday décor, in this case making it accessible and easy to find. Winter Glow will transform Grand Park into a whimsical beacon that draws Angelenos downtown to interact with art and each other. 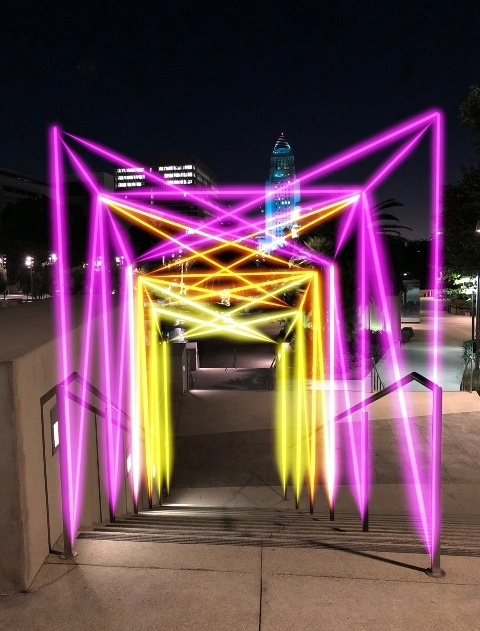 The only free exhibit of its kind in the area is open to the public from December 1 - 25, 2018, offering park goers the opportunity to gather, enjoy the holiday season and celebrate the wonder of art as it illuminates Downtown L.A.
Angelenos will experience Grand Park like never before with 19 curated large-scale interactive light installations featuring displays designed by L.A.-based artists along with those designed by Grand Park team. Iconic elements of the park, including the Arthur J. Will Memorial Fountain, will shine as familiar pathways lead to exciting new discoveries throughout the 12-acre park. The latest in light and projection technology will transform park spaces, which will “glow” alongside the park’s traditional holiday décor, including the L.A. County Christmas Tree and the Grand Park pink light tree and menorah. A Spark of Light, by Aphidoidea. Guests will be able to go inside this installation, interact with touch sensors and control how the piece sparks and changes color. The Net (Neon Network), by H+ Creative. Guests will be able to descend the top two stairs from the park’s Fountain Overlook surrounded by the warm glow of this fully immersive neon light network. The Wave Pendulum, by Two Bit Circus. Guests will work together to trigger the initial motion of these suspended pendulum balls, and physics and gravity will evolve the undulating movement. Infinity Mirror, by Two Bit Circus. Guests will be mesmerized by this wall-mounted display of dazzling LED lights in continually changing patterns. December 1 - December 25, 2018 |Sunset to 10:00 p.m.
A vibrant outdoor gathering place, Grand Park is a beautiful public park for the entire community in Los Angeles County. With expansive green space for gatherings large and small, Grand Park celebrates the county’s cultural vitality and is host to community events, cultural experiences, holiday celebrations, and many other activities that engage and attract visitors from all communities. The 12-acre Grand Park stretches from The Music Center on the west to City Hall on the east and is easily accessible by Metro via the Red/Purple line to the Civic Center/Grand Park station. The park was named one of American Planning Association’s 10 “Great Public Spaces” in the U.S. for 2013. Working closely with the county, The Music Center is responsible for all operations and programming for the park. For more information, visit grandparkla.org. Follow Grand Park on Facebook (GrandParkLosAngeles), as well as Twitter, Instagram and Snapchat (@GrandPark_LA). The Music Center convenes artists, communities and ideas with the goal of enriching the cultural lives of every resident in Los Angeles County. The non-profit performing arts organization has two divisions: The Music Center Ops, which manages The Music Center’s four theatres, an outdoor plaza and Grand Park on behalf of the County of Los Angeles; and The Music Center Arts, which curates a world-class dance series, Glorya Kaufman Presents Dance at The Music Center; produces and presents programming in other arts genres with a focus on engagement; and presents nationally recognized arts education programs. The Music Center is also home to four renowned resident companies – Center Theatre Group, the LA Master Chorale, the LA Opera and the LA Philharmonic. With The Music Center On Location,™ the non-profit performing arts organization brings events and activities to locations outside of its Downtown Los Angeles campus. The Music Center also programs and manages Grand Park, a 12-acre adjacent greenspace, with year-round free programming. For more information, visit musiccenter.org Follow The Music Center on Facebook, and follow @MusicCenterLA on Instagram and Twitter.